Okay! I’m actually getting these notes out on the day the issues are released - not so bad. Two books out today, Daredevil #611 and Vader #23. Let’s start with DD, part three of The Death of Daredevil: Art and cover by Phil Noto and letters from VC’s Clayton Cowles. As I mentioned in the last set of notes, each issue in Death of Daredevil is titled after a specific fear that I think Matt Murdock certainly has, despite his “Man Without Fear” nickname. This one is called "Phobophobia,” which is, of course, the fear of fear. Matt is utterly focused on being fearless, of leaping before he looks, of not giving in to terror. But that just means you are afraid, of fear. This issue features tons of Daredevil’s scariest villains coming together to take him down, not least one of my all-time favorites, Stilt-Man. I love writing hugely choreographed battle scenes, with various powers from various people connecting and affecting each other in cool ways - that’s basically this entire issue. Only one more issue after this, #612, which is crazy to think about. I think it’s one of the best I did in the run, but at least one Marvel editor I spoke to who read it thought it might be controversial from a story perspective… could be, could be. We’ll see. I am Charles Soule, and I am not afraid. Moving on to Darth Vader #23… art and cover by Giuseppe Camuncoli, letters from VC’s Joe Caramagna, colors by David Curiel, inked by Daniele Orlandini, and the cover was painted by Elia Bonetti. Notes below the image. Yowza, we are getting close to the end of this run too! So strange to think that in a month or so, I won’t have any more Daredevil, or Vader, or Poe, or… well, this is the way it goes. The job isn’t to write books forever, it’s to write amazing books. And, in my opinion, amazing books have endings. 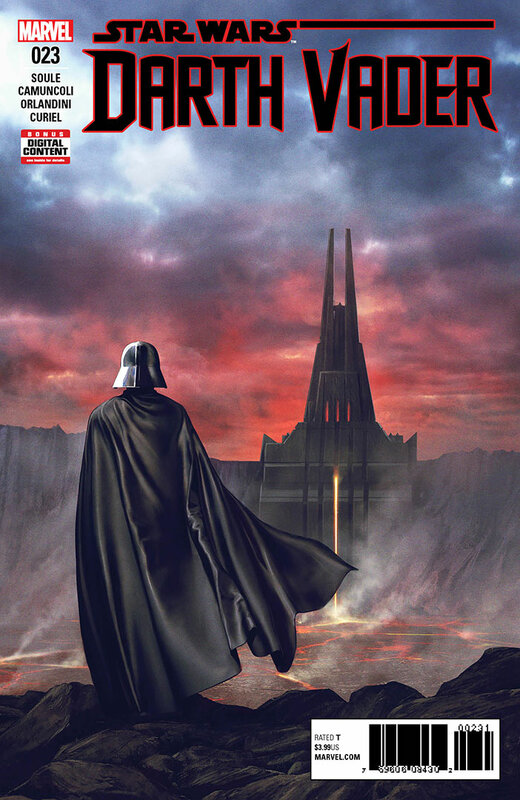 Vader #23 is part five of the seven-part FORTRESS VADER arc, which I am so happy with. This is the story that finally sees Vader’s Mustafarian castle designed and built, and we get to see a ton of everyone’s new favorite new Sith jerk in it, Lord Momin. The fun thing here for me was that it got to have a little humor, which can be hard to include in a comic about one of the galaxy’s most prominent murderers. That’s it for now. I’m all caught up on writer’s notes! Nothing for next week from me, but in two weeks it’s big, with Return of Wolverine #3, my last Daredevil issue with #612, Vader #24 AND (I think) Curse Words #18. WOW! Might be my last four-comic week for a while. See you then!